Open the shuttle bay doors and bring your science fantasy adventures to life with this beautiful pawn collection designed to use with the Starfinder Roleplaying Game or any tabletop roleplaying game! Within the Starfinder Core Rulebook Pawn Collection you'll find 100 unique creature pawns, including members of all core races and classes, perfect for representing your next character or deadly foes, as well as bizarre alien monsters to aid or challenge your players. In addition, you'll also find 15 unique starship models from the Starfinder Core Rulebook to help you better track the laser-filled chaos of space battles. Best of all, this set contains multiples of most pawns, so your heroes, will always be able to face off against a horde of space goblins and security robots or bast their way through a fleet of warships! Printed on sturdy cardstock, each pawn slots into a size-appropriate plastic base from the Starfinder Pawns Base Assortment, making them easy to mix with traditional metal or plastic miniatures. 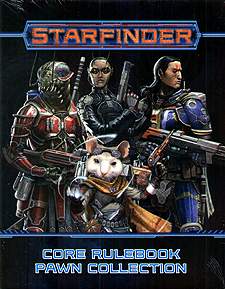 The Starfinder Core Rulebook Pawn Collection is the best way to ensure you've got the perfect character for every Starfinder Roleplaying Game encounter! This product does not include bases. It is intended for use with the bases found in the Starfinder Pawns: Base Assortment or any Pathfinder Pawns bases.